Red meat can be one of the most expensive things to buy at the supermarket and eating too much of it can also have consequences to your health. On average, people who eat less meat weigh less than those individuals who eat meat more frequently. This doesn’t mean you have to cut out all meat, but you should exercise moderation when adding meat to your diet. The same applies to dairy products, fruits, vegetables and grains. To simplify choosing the right foods in the right proportions, Nutrition Australia has developed the Healthy Eating pyramid. 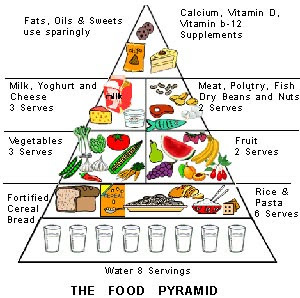 It arranges foods into three groups – showing which foods we should eat most often, in moderate amounts, and least often. There is a reason for the healthy eating pyramid, and that is to keep our diets healthy, but a definite side benefit is the positive effect healthy eating can have on our grocery budget. Sticking to the recommended portion sizes will not only help your health but your budget too.